Our envelope system does it all. It creates a comfortable growing environment for animals, combats rising energy costs and boosts productivity. Our proprietary fiberglass technology virtually eliminates any internal convection within the insulation to provide superior thermal performance, day after day, month after month, year after year. ThermaCare Stable will not shift or settle. It is designed to remain effective for the life of the building. Find out more about these products below. Ag Stable R – Stabilized Blowing Insulation is a blown-in solution that ..
Ag Dura Fabric is a durable lightweight tri-ply fabric, with an extra dense .. Custom propriety woven seal tape for our Ag Dura Fabric to insure ..
Ag Banding is a green polyester banding for heavy duty agricultural applications. 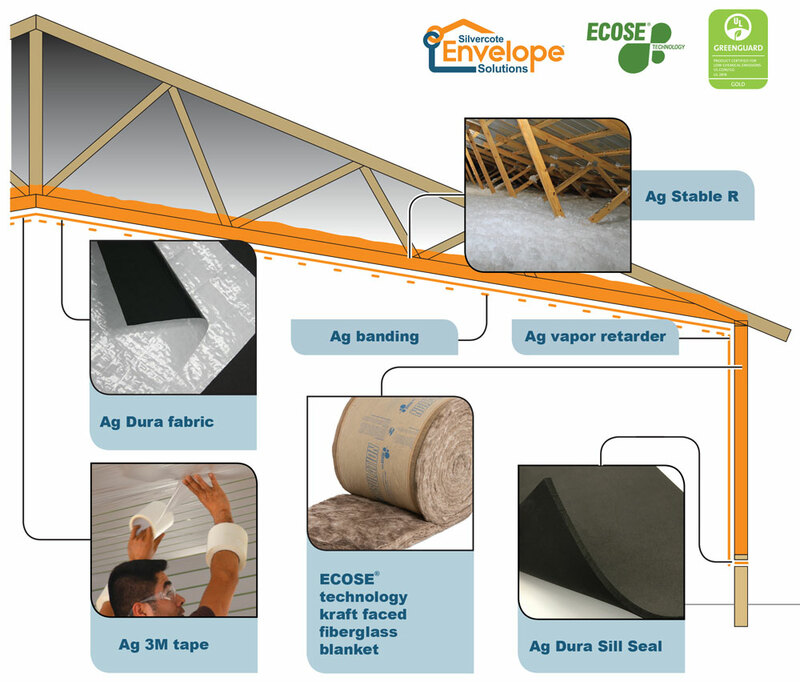 ..
Our fiberglass blankets, for the walls, with ECOSE® technology are faced with ..
Ag Vapor Barrier: provides airtightness behind the plywood. The Ag Vapor Barrier ..
Ag Dura Sill Seal is a durable solution that provides a seal ..
For over 80 years Silvercote has partnered with customers to provide innovative custom insulation solutions and systems. As part of the Knauf Insulation family of companies, Silvercote has access to the latest technology in producing insulation products.